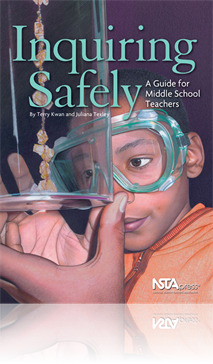 Not your average safety guide, Inquiring Safely is a uniquely readable resource from experienced teachers who know both middle school science content and how middle school students behave. The authors go beyond the standard rules and regulations to discuss safety concepts in the context of real classrooms—and to help you make students your partners-in-safety within an inquiry-based science curriculum. New and veteran teachers alike can use Inquiring Safely to develop better approaches to equip labs, dispose of chemicals and other hazardous materials, maintain documentation, and organize field trips. Some chapters cover specific disciplines, such as physical science, chemistry, Earth science, and biology. Others deal with general topics such as supervising students’ online activities, accommodating students with special needs, and working with volunteers. Special features include an unusually detailed index plus model student contracts and permission forms. Like Exploring Safely: A Guide for Elementary Teachers, this essential book emphasizes a preventive approach to an up-to-date range of potential hazards. Given increased scrutiny of teaching practices and growing concerns about liability, Inquiring Safely belongs on the reference shelf of every middle school science teacher.